Recent and upcoming sightings. – Brian Beatty: Writer. Jokester. Bearder. It was recently brought to my attention by absolutely nobody that I’d not updated my site since mid-January. I have my reason: I’ve been busy. Writing, performing, podcasting, etc. Don’t believe me? 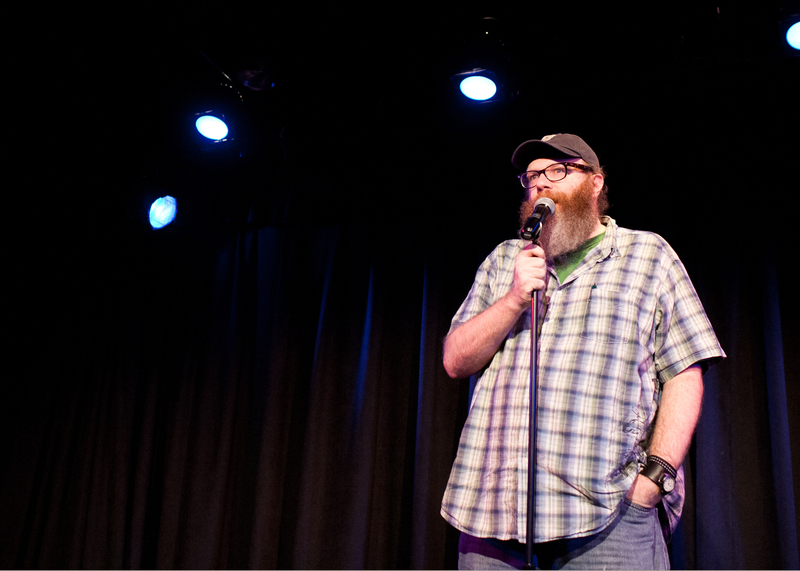 Here’s a pic of me teeing up an old story I performed at the Just Vote No Show at the BLB a while back. This charity gig had to happen because cowardly statehouse haunters are asking Minnesotans to vote to amend the state constitution to discriminate against gays. Which is ridiculous. Happy, loving couples of every orientation deserve insufferable in-laws. The above photo’s by Emma Freeman Photography, a talent with a taste for photographing gay weddings. Hint, hint, Minnesota. Upcoming gigs include comedy at the MIA (for Third Thursday, April 19) and a new story at the Soap Factory (for a Talking Image Connection reading, May 12). Then I prep for the 2012 MN Fringe. So see you around.